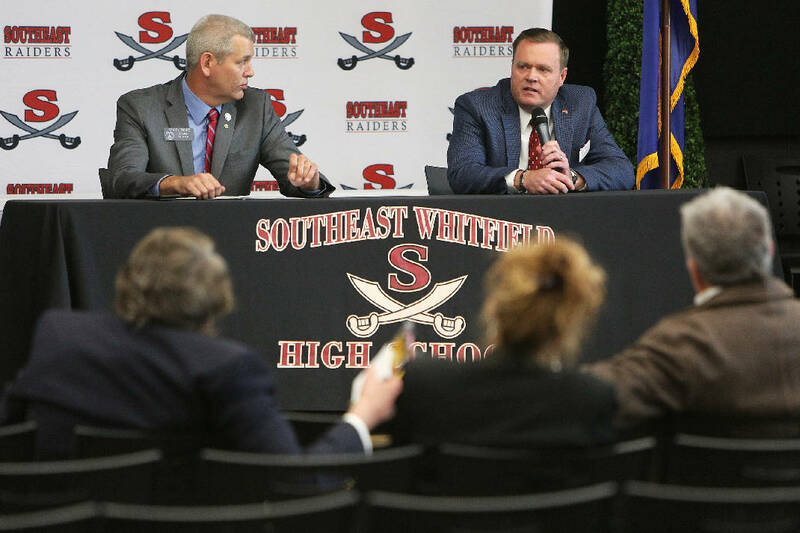 Sen. Chuck Payne and Scott Tidwell answer questions during a candidate forum for the May 22 primary Tuesday, April 24, 2018 at Southeast Whitfield County High School in Dalton, Ga. The two will be running against each other for the District 54 State Senate seat in the upcoming primary election. DALTON, Ga. — State Sen. Chuck Payne told his opponent Tuesday evening that he was tired of the lies he's been spreading, that he "illustrates all that I'm working against." The trigger? A letter Payne's challenger, Scott Tidwell, sent residents this week. It says Tidwell is running for office May 22, and that he has a lovely wife of 24 years, and that he has four children, and that he works at a local funeral home. Also: "Our current Senator has aligned with the left-wing Democrats at our state capitol on the issue of illegal immigration." Payne, R-Dalton, told a small crowd during a forum at Southeast Whitfield County High School that the letter is "without truth. And there's nothing in it that represents anything of truth." As a state lawmaker, he said, he has no control over immigration policies. He said Tidwell should know that. "For my opponent to continue to go around and saying I'm for illegal immigration — I'm not," he continued. "And that's not honest. And that's not truth. I have committed myself from the time I started this that I'm going to be honest." He then attacked Tidwell for their first interaction after Tidwell qualified to run. Payne told the crowd that he texted Tidwell, wishing him good luck in the race. At Tidwell's invitation, Payne spoke at the church that Tidwell pastors. He said he hadn't heard any complaints from Tidwell about his work in the legislature. But when Payne texted him about their race against each other, he said Tidwell told him he had been trying to figure out a way to break the news to him. "Scott," Payne said Tuesday, during the forum hosted by the Dalton Daily Citizen-News, "you were already a loser before you even came out of the gate." Sitting next to Payne, Tidwell said he did not remember the specifics of their text exchange last month. After the forum, he told the Times Free Press that he stands by the letter. He believes Payne should stand by state laws that can make life more uncomfortable for undocumented immigrants. "We need to do everything we can to keep Georgia from being a magnet for illegal aliens," Tidwell said. He decided to run against Payne after the state senator's Feb. 21 vote on a bill that would have given undocumented immigrants a different type of driver's license. Sponsored by state Sen. Josh McKoon, the bill proposed to create a "Driver's Safety Card" for immigrants with work visas. The cards would expire when the person's work permit did. It would also read "NO LAWFUL STATUS" and "NOT ACCEPTABLE FOR OFFICIAL PURPOSES." With Payne's vote against the bill, it died in the Senate Public Safety Committee, 5-4, before it could reach the chamber. He said he opposed the bill because Georgia driver's licenses already say "limited term" on them when given to immigrants here on a work visa. He believes the new licenses would cost too much money, and he doesn't think they would have much impact. But Tidwell said the bill would discourage immigrants from coming to Georgia illegally. Ultimately, he believes this will save the state money. Neither side provided estimates for the cost of the licenses. "The illegal alien problem is threatening the economic state of Georgia," Tidwell said. Compared to other parts of North Georgia, immigration issues are particularly important to Dalton. About half of the city's population is Latino. On Tuesday, both candidates said they oppose allowing Deferred Action for Childhood Arrivals recipients, commonly known as dreamers, from paying in-state tuition to Georgia colleges and universities. The Georgia Court of Appeals ruled against DACA recipients appealing for the benefit last year. Dalton State College could benefit from such a measure, as it became Georgia's first Hispanic Serving Institution earlier this year. The federal designation opens the school up to federal grants, so long as 25 percent of its population remains Latino. Payne and Tidwell will face each other in the May 22 primary election. The winner of that contest will then go on to face Democratic challenger Michael Morgan in the November general election.